Many animal behaviorists believe that dogs who are habitually chained pose a greater risk to attack people, particularly children. Moreover, the chaining of dogs is strongly discouraged by humane societies, and in California it is illegal to chain a dog for an extended period of time. Science also backs up this belief: Severe attacks on people by dogs who are chained, or who had recently broken free from a chain, happen a disproportionately high rates. Nevertheless, owners continue chain their dogs, for a variety of reasons, and this creates potential danger for nearby people. Some dogs who are habitually chained become aggressively protective and possessive, and these tendencies could can easily manifest themselves when children are within “striking distance” of the dog. The nature of a child’s play behavior, such as erratic and rapid movements, high-pitched vocalization, are the elements of a child’s play that could easily aroused aggressive tendencies in some dogs restrained by a chain. Moreover, a child may not understand the danger of approaching a chained dog which they do not know. A case in point happened in February, 2014 in Salt Lake City, Utah. A pit bull type dog who was chained in the backyard broke free and severely attacked a six-year-old boy playing soccer in the same yard. Fortunately, the dog’s owner was present and was able to pull the dog off, but not before the lip his was torn off, parts of his arm were missing, and his cheek was left hanging. The boy was hospitalized and underwent emergency reconstructive surgery. Prior to the attack, people in the neighborhood expressed concerns about this pit bull, but the dog apparently was never reported to animal control. The extent to which this pit bull had been socialized and exposed to children is not know. 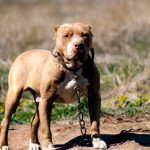 Although chaining may increase the likelihood of dog bite attack, it doesn’t necessarily mean that chaining ia a causative factor underlying a dog’s tendency to attack a person. Chaining may contribute to engendering aggressive tendencies in some dogs, but not all dogs. Many dogs can be chained without negative consequences. Some animal behaviorists believe that the discomfort a dog receives around the neck when it pulls hard on a chain may promote a negative association with people. 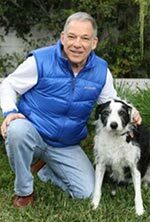 Moreover, habitually confining a dog to one area may make some dogs more possessive of that area, and this may be particularly true in dogs with already established aggressive propensities. If an owner needs to restrain a dog, then other options should be considered, like a moving pulley. If the dog has aggressive tendencies, then this kind of restraint, which allows the dog more freedom to move sideways, may not have as much impact on a dog’s aggressive tendencies when compared with the fixed restraint imposed by a chain.